Happy Thursday Clemson Girls! How is everyone's week going? We are excited about another giveaway today on Clemson Girl - this time from online gameday boutique Fashion Savvy Fans. 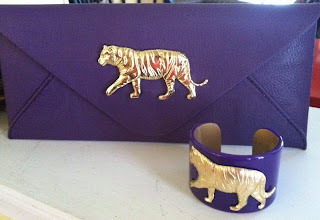 How amazing is this purple clutch with gold tiger emblem and matching cuff bracelet? This would be perfect for gameday, but also perfect for a fancy night out. Deadline for entries is Midnight EST, Friday, August 23. We will randomly draw a winner this weekend and contact them by email. The winner will have 72 hours to reply to our email or we will draw a new winner. Special thanks to Fashion Savvy Fans for sponsoring today's giveaway! Good luck Clemson Girls! Love this Tiger Clutch and Bracelet! And can't wait for Clemson-Georgia game! So darn awesome! LOVE it! Outside of the ACC I'm looking forward to both the UGA and USC games, but the Clemson FSU game is one I always look forward to! Talk about elevated game day style--these are gorgeous! Love the Clutch and bracelet! These are just too cute! I'm looking forward to hosting GameDay for UGA! I love these! Go Tigers!! That will be perfectly match my game day attire! GO TIGERS! These would be perfect for my daughter, Jill, who is a two time graduate of Clemson. Hard choice - I'm most looking forward to UGA or FSU. Cute stuff! I can't wait for football season, especially the big ones - UGA, USC, FSU. Excited for the games to begin! And it is fun to have cool accessories to go to the games! I am most excited for Clemson-UGA because as a recently converted Clemson fan, it will be my first night game. Sooo excited for the Georgia game, and I would love to show up holding this clutch & wearing the cuff!! !